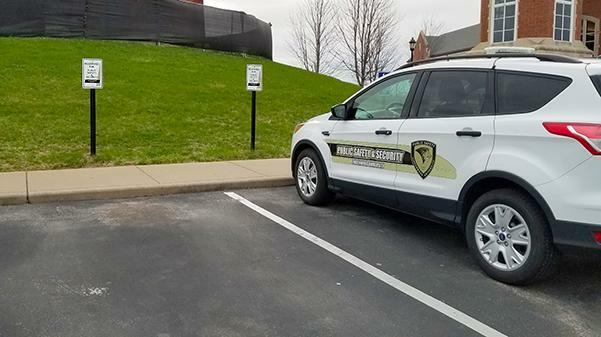 One of Lindenwood University's Public Safety & Security vehicles parked in a designated parking spot in the upper lot of the Spellmann Center. September is National Campus Safety Awareness Month, and Lindenwood is hosting an event to encourage public conversation about security issues. Pizza with Public Safety will be held from 1-3 p.m. Sept. 26 outside the Library and Academic Resource Center. This event is free. “It’s just a great time to kinda network between students and staff,” said Paula Stewart, coordinator of Clery Act compliance at Lindenwood. In addition to the open forum, Public Safety makes presentations throughout the year on topics like: sexual assault/consent/bystander intervention, domestic violence and campus safety. Stewart said that campus safety awareness for Lindenwood is all year long. For more information, contact the security office at 636-949-4911.